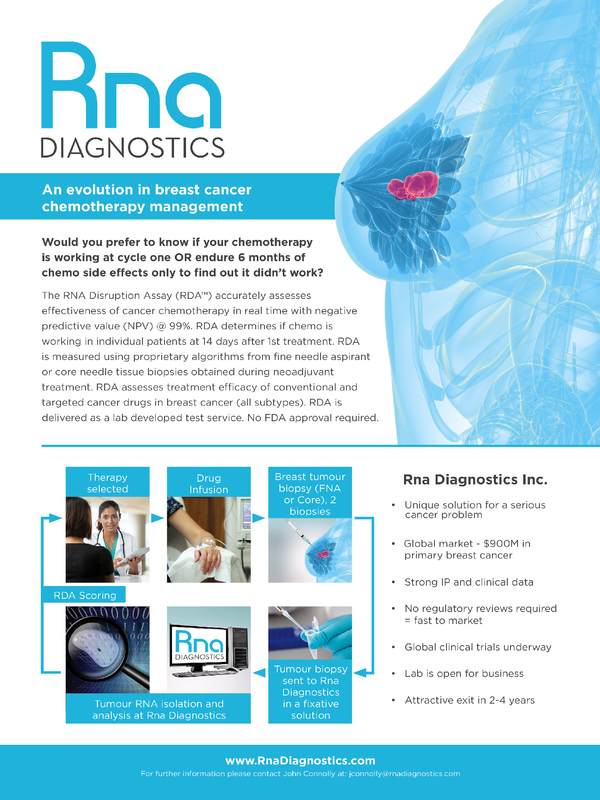 While the primary focus of RNA Disruption Assay (RDA) continues to be breast cancer chemotherapy management, it is rapidly evolving into a platform technology that will be utilized in the management of treatments across multiple cancers. RDA is now being employed in clinical trials for other forms of cancer including; head and neck, rectal and metastatic breast cancer. “As cancer specialists around the world began to understand the capabilities of RDA, we have received requests to employ the technology to assess response to treatment across several different cancers,” said John Connolly, Vice President, Corporate Development of Rna Diagnostics. Dr. Andrew Pearce, Chief of Oncology, Northeast Cancer Centre of Health Sciences North in Sudbury, Ontario, is leading a study that utilizes RDA in assessing response to chemoradiotherapy for squamous cell carcinoma of the head and neck. “If successful, this trial could decrease the long-term morbidity of chemoradiotherapy for head and neck cancer patients, improving their quality of life,” says Dr. Amadeo Parissenti, Chief Scientific Officer of Rna Diagnostics. In Ireland, RDA will be utilized in a multi-centre study of locally advanced rectal cancer patients treated with radiotherapy conducted by the All Ireland Cooperative Oncology Research Group (ICORG). The clinical trial has ethics approval and has begun the patient accrual process. This study is expected to involve over 200 patients. 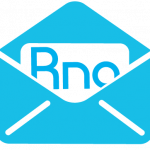 “RDA is an exciting new technology that addresses a serious unmet need. Current methods for assessing treatment efficacy are inadequate. With RDA testing we will be able to tailor treatment to actual patient response. We are very interested in exploring how RDA can help us improve treatments for both breast cancer and rectal cancer patients,” said Dr. Bryan Hennessy, Consultant Medical Oncologist, Beaumont Hospital, Dublin and Our Lady of Lourdes Hospital, Drogheda, Senior Lecturer, Royal College of Surgeons in Ireland (RCSI), Adjunct Professor at The University of Texas MD Anderson Cancer Center and Dublin City University (DCU), Vice Chair of ICORG, the Irish Clinical Oncology Research Group. Finally, in Switzerland, there will be a prospective multi-centre clinical trial with members of the SAKK (Swiss Group for Clinical Cancer Research) studying the use of RDA in the management of treatments of metastatic breast cancer. Breast Cancer Research and Treatment recently published the study, “Tumour RNA disruption predicts survival benefit from breast cancer chemotherapy.” In this multi-centre neoadjuvant trial (NCIC-CTG MA.22) of patients with locally advanced breast cancer, patients were treated with six to eight cycles of epirubicin/docetaxel chemotherapy. The purpose of the study was to assess the relationship between mid-treatment tumor RNA disruption and both pathological complete response (pCR) post-treatment and, subsequently, disease-free survival up to 108 months post-treatment. To meet this objective, Rna Diagnostics developed the RDA to quantify tumour RNA disruption and stratify patients into three response zones of clinical importance. The peer-reviewed study revealed that RDA was superior to pCR, the current gold standard for predicting survival, supporting the prospect of RDA use in response-guided chemotherapy. Rna Diagnostics was awarded first place in the RESI Innovation Challenge held in Boston, Massachusetts in September. The RESI Investor conference included an Innovation Challenge featuring 30 of the most innovative early stage life science companies selected from over 250 cutting-edge biotech, medtech and healthcare IT entrepreneurs.